ship will operate between Downtown Pittsburgh, the Strip District, Bloomfield, Friendship, Negley and Stanton Avenues, Chislett, Greenwood and Jancey streets. Limited trips will operate to Baker and Butler streets. Service to Larimer from East Liberty, formerly offered by the 94B, will be available on route 74 Homewood-Squirrel Hill. Meanwhile, service to Waterworks is available on route 74B and 500 from East Liberty. Both operate through Highland Park, not Morningside. Alternate trips on route 87 will serve Stanton Heights beyond Stanton at Chislett. Limited trips will operate to Baker and Butler streets. 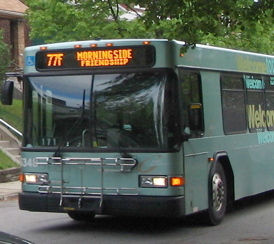 Service on the Stanton Heights branch of 87 Friendship will operate seven days a week.